Preamble: If potential purchaser is not willing to work on a high professional level of communication, integrity, and ethics please do not move forward with this contract. 1. Travel Date is date established to go to your home. Flying starts at 8 weeks of age. This puppy/ies will have a health certificate issued prior to flying, paid for in price of pup. 2. Flight ticket is agreed to be paid by purchaser. Crate, pet weight average $300 (Alaska $400) at 8 weeks of age. At 8 weeks travel to airport is paid in pup price. Afterward a gas charge may be assessed depending on situation. Coordinating; A) Austin, direct flights are preferred and would be the travel day set. B) If other airlines, can go direct via Houston or San Antonio, they will be set for the next day or two; This is coordinated at 6 weeks of age of pup. C) After that, flights set as coordinated. 3. Puppy is micro-chipped no later than 5 weeks old ($100 value). Purchaser will receive papers to file registration with AKC upon final payment of pup, unless Dual sire litter which may take up to 6+ months. 4. Purchaser takes full responsibility at Travel Date and agrees to establish a relationship with a reputable vet to keep up to date health care. Purchasing a puppy/ies should not be an impulsive decision; he/she is not sold on a trial basis. You are making a decision for its life time. 5. It is agreed this puppy/ies will never be placed in a shelter. Purchaser guarantees TI that they will work with/return this puppy so a loving home may be found. 6. As a "PET ONLY," purchaser agrees to spay/neuter or ligation/vasectomy no sooner than 10 months, no later than 12 months old, unless other agreement made. Hormones are important to a healthy pet. Once completed, copy of vet documents must be mailed to TI. 7. It is agreed this puppy/ies will be registered with AKC along with the pup’s micro-chip information for tracking if lost, papers will be provided in order to do so. A) Food: TI recommends a 5 star rated product found on www.dogfoodadvisor.com , preferably an “Organic Grain Free” product to assist alleviation of chemical health ramifications, less flatulence, and overall health. Research has TI using various dry dog foods which will be shared in puppy email tips and notes and the current checklist provided at time. Low grade dog foods are found to cause health issues with your standard poodle. B) Supplements: TI recommends and has found her standard poodles periodically supported with NuVetTM Plus Canine supplement has led to a healthier life, unless other agreed upon. Nutritional supplements help during times of spiritual stress, growing bone nutrition, and eating irregularities. You agree to have supplements in place at pups Travel Date to assist the transition to new home and bone growth up to 1 yr of age. Nuvet supplement ordering information: NuVetTM Plus Canine supplements ordering code #89093. They are a great treat, order via internet www.NuVet.com , or toll free 1-800-474-7044 from 8am-6pm Pacific Time. C) Notification: A veterinarian’s letter must be received explaining congenital defect, and you agree to humanely put this pet to sleep, as TI does not want to cause any financial or spiritual burden on you or your pet. A copy of the euthanizing must be sent to TI at which she will reimburse you for this cost. D) Ownership: You must be puppy’s original owner, sending pup’s AKC papers to TI. E) Exclusions: This does not include hips. 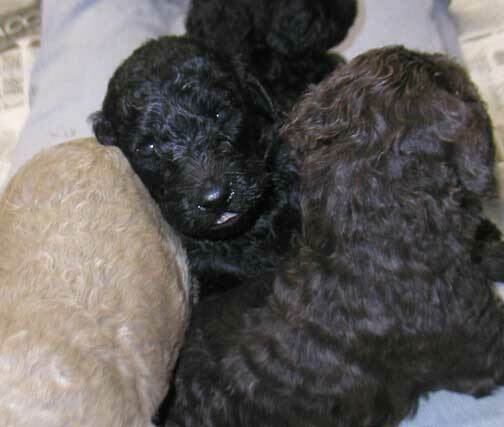 TI standard poodle parents are tested for hip dysplasia to be Fair, Good or Excellent. PennHip is also done at an early age and must be 50% and up, Chiropractic pet care is used on all parents to maintain healthy bodies, as TI recommends customers do the same. Puppies get their first adjustment around 7 weeks of age. A pet’s tumbles in life, spay/neutering growth change or other physical factors can change even “Excellent” results if not properly cared for. Chiropractic care is an important part of maintaining their structural health. We cannot be held responsible if not taking our recommendations. 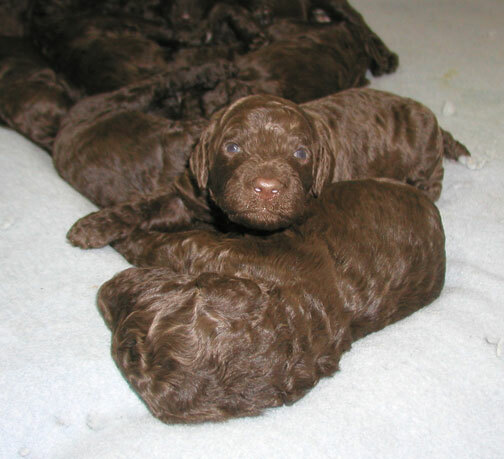 a) TI has a vet examine each pup within three days of birth. It is the time frame in which tails are docked and dew claws removed. b) At 6 weeks of age the pups are examined again when they receive their first set of vaccinations at which time you may decide on your pup. d) Choice of pup must be made by 6 wks of age with full payment at that time. TI signs the contract and returns with other registration data with receipt of your pup. Your pup has now been examined by a vet twice. In flying or traveling across state lines your pet is examined a third time for health certificate. · With your down payment, TI is committing time and money to do her best in communicating and working with you. TI needs to know you are committed in receiving a pup/s, thus there are no refunds once a down payment is made. IF one needs to cancel, the down payment will always be available for your return when you are ready for a pup from TI at which you will be given priority accordingly as long as TI is still breeding. · Adult size, confirmation, color, and temperament are not guaranteed. TI assumes no financial responsibility for the puppy after leaving our premises for medical expenses due to accidents, injury, behavior, or for any other non-contracted issues. · Providing adequate exercise and human contact is a necessity in owning any puppy or dog, especially the larger breed. Cesar Millan the dog whisperer show will help you be the Leader! 9. _______________________(Purchaser’s name) agrees this puppy is purchased as a "PET ONLY" (surgically fixed to have no offspring) and offered under AKC’s Limited registration papers. 10. Pet purchases are a luxury item in TX. TI will pay sales tax of pet over $1,001. 12. Included in pet price: Micro-chip ($100 value), health/flying certificate for out of state travel ($40 value), first vaccination - Parvo ($40 value), crate for flying at 8 wks (up to $70 value). By signing below, I acknowledge that I have read, understand and agree to the above contract. *Congenital defect: A physiological or structural abnormality that develops at or before birth and is present at the time of birth, especially as a result of faulty development, infection, heredity, or injury.